When I first heard that a film adaptation of James Dashner’s “The Maze Runner” was forthcoming, I reacted to it with the same sanctimonious ambivalence with which I have welcomed most of the recent attempts to spin gold from young-adult fiction. But then I saw the trailer, with its hints of Goldingesque mores and Lindelofian enigma and began to feel genuine excitement. 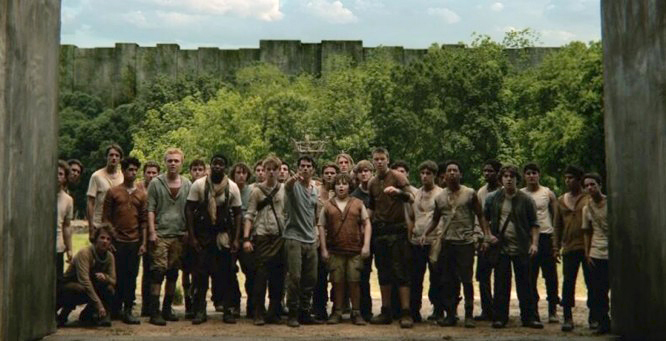 Why are these boys trapped in a maze? Who are they and who put them there? What lies beyond the monolithic walls? These were questions that I didn’t even know I had but after two minutes of carefully-curated images I needed answers. In large part, my anticipation was rewarded and my (admittedly low) expectations were exceeded. The Maze Runner preserves a healthy sense of mystery throughout it’s 113-minute running time, carefully pacing its revelations and building to a climax that is both emotionally rewarding and deceptive. It’s not without it’s faults, clearly. Convenience plays a large role in getting the plot from A to B to C and the *ending* is little more than an exposition dump setting up a far-from-guaranteed sequel (see: Ender’s Game, Beautiful Creatures, Mortal Instruments, Eragon, etc.). But the action is tense, the plotting is tight and best of all, the film gives us a YA-adaptation with more on its mind than who our protagonist will choose to date. The film starts abruptly, almost jarringly so, as our as-yet-unnamed hero awakens to find himself rapidly ascending a dark elevator shaft with no memory of how he got where he is or any other detail about himself. Reaching the top, he finds himself thrown into a rag-tag band of a couple dozen young men (including the adorable kid from Love Actually) who arrived in the same manner he did over the space of roughly three years and who have built themselves a relatively prosperous society, albeit one that is confined to the interior courtyard of an enormous labyrinthine enclosure. Eventually he regains his name, Thomas, and learns the lay of the land: every boy is expected to contribute to the well-being of the fragile society, and each day a select group of “runners” explore the maze looking for a way out. At sundown the gate to the interior courtyard, or “glade” automatically closes and anyone trapped outside has historically never been heard from again. Naturally curious, it doesn’t take long for Thomas to venture beyond the safety of the Glade, with his actions triggering a break in the status quo that will either lead to long-sought answers or the demise of everyone trapped in the maze. Director Wes Ball makes a number of wise decisions in his creation of the film, particularly that the audience never knows more than our protagonist — with the exception of one final scene that asks more questions than it answers. Readers of the book series may anticipate what’s ahead but newcomers will find themselves dropped into a wholly unfamiliar and unexplained world where any outcome seems possible. The computer generated effects are presented with a light-handed touch, keeping a sense of eerie claustrophobia while giving the action room to breath and creating a daunting scope for the Maze without sacrificing tangible environments for the characters to interact with. The performances by the almost exclusively non-adult and unknown cast members are also particularly good, anchored by Dylan O’Brien (Teen Wolf) and We’re The Millers’ Will Poulter as a de facto antagonist. With so much of the story’s secrets kept hidden in a mystery box until the potential sequels, it’s difficult to say whether The Maze Runner is a clever creation or a bundle of nonsense. But if this first film is all we ever get, then it’s an satisfying tale of survival that leaves you wanting more. Ever since last summer’s release of The Twilight Saga: Breaking Dawn: Part II: Electric Boogalloo, there’s been a supernatural romance vacuum in the realm of Hollywood franchises. Much like how TV is still trying to achieve the “next Lost” (Sorry, but Revolution leaves much to be desired), cinema execs are chomping at the bit to find the next sappy YA adaptation to make buckets of money off the wallets of awkward teenagers and escapism-addicted middle aged women. Cue Beautiful Creatures, the first in an assuredly planned franchise based on the Caster Chronicles book series. It centers on a boy, fancy that, in this case the athletic Ethan who is discontented to be the stereotypical jock and instead spends his free time devouring the banned writings of Rand, Vonnegut, and Salinger, sketching the female vision that haunts his dreams and dreaming of the day when he can finally say “adieu” to his small, southern, backwards town. But then, a mysterious new girl named Lana arrives in town to stay with her uncle, the local rich, eccentric hermit and supposed devil worshiper. Lana sends ripples through the school and community, immediately catching Ethan’s eye. The two teens share a meet cute in the rain and proceed to fall head-over-17-year-old-heels in love with each other but of course, her family doesn’t approve, because Lana is a witch and obviously that sort of thing is forbidden. Where the Twilight films creatively drown under the weight of their own nauseating self-seriousness, Beautiful Creatures manages to keep things light and playful. Supporting castmembers Emma Thompson and Emma Rosum gleefully vamp it up, chewing the scenery as a pair of evil “casters” – their term for magical folk – while Jeremy Irons provides the emotional moxie as the family patriarch and Lana’s guardian. Much like how Twilight is a tale of vampire meets girl, Beautiful Creatures is a tale of boy meets witch. Creatures is not particularly good, but it is spared from being ultimately bad by two things: it’s deep-south setting and the winning charm of relative newcomer Alden Ehrenreich as Ethan. I was well-prepared to despise Ethan from the moment his heavily-accented voice-over narration opens the film, but after a few glimpses of his wide, Cheshire grin and a few pinches of snappy, if less-than-inspired dialogue, he won me over. In another rarity, he and Alice Englert, his partner in magical romance, actually present their characters as a believable pair of goofy, nerdy, teenage lovers. Compared to the photo-shopped perfection and age-stretching of the Twilight cast (and any other movie set in High School) Ethan and Lana actually come across as a reasonably authentic adolescent couple, even though lightning bolts occasionally shot out of Lana’s fingers. Likewise, the film’s deep south setting is one of its greatest strengths, imbedding the film with a certain sense of mysterious cool. Much like other fictional southern works, like Skeleton Key or Midnight In The Garden of Good and Evil, the scenery and setting are used as though they were extra characters. The generic townsfolk are dismissible and two-dimensional, bordering on caricature, with the exception of Viola Davis, who brings the soul as a family friend with a few secrets up her sleeve. Ultimately, Beatiful Creatures is an adequately enjoyable, albeit blocky and unpolished, fantasy. It has just enough fun to keep things moving and to nearly make up for the laughably awful visual effects. After making it’s money in spades – as I assume it will – I wouldn’t be completely disinterested to see what happens next. *Beautiful Creatures opens wide in theaters on Feb. 14, 2013.